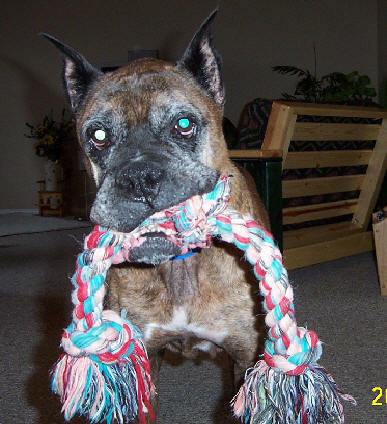 Johnny is a wonderful 11yr young boy was rescued by Boxer Rescue from a shelter in Washington. He acts half his age. Johnny loves to go for walks and car rides, and he absolutely adores his toys. He likes to flip his rope around and then comes running to you to show it to you. Johnny also loves children. It was wonderful having Johnny around, but since he didn't like other dogs or cats, we had to find him a home of his own. Boxer Rescue did just that and now he is in his home being pampered and spoiled. 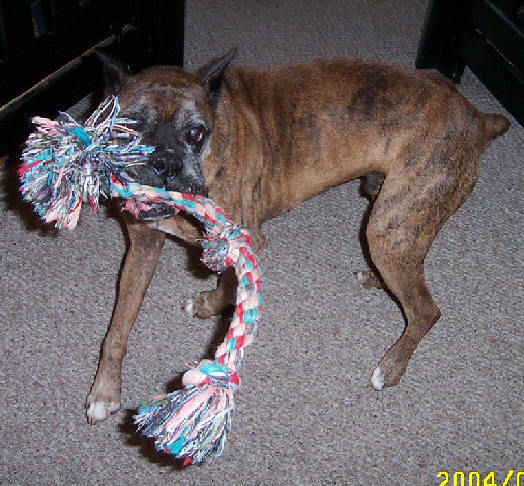 Johnny brought something to our lives that only an older boxer could. He reminded me of my Georgie girl who I had lost 8 months prior. The older ones have a way about them that just makes you smile and a wisdom of know how far to push you to get what they want. Thanks Johnny for putting up with us!